Today’s testimonial comes from Rachel Yuska ’15. 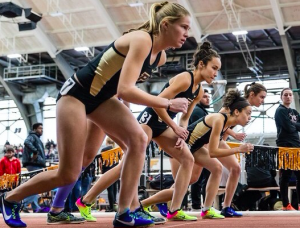 While at Guerin Catholic, Yuska received 8 letters across three sports-track and field, cross country and soccer while helping the track and field and cross country teams win the All-Catholic championships in 2014-2015. Yuska was also recognized as the the Guerin Catholic Female Athlete of the Year in 2015. In addition to her athletic accomplishments, Yuska was President of the National Honor Society and a Salutatorian in her graduating class. 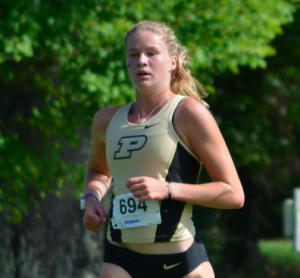 Yuska is now running collegiately at Purdue University. I think about Guerin Catholic every day. I miss many things about it. I miss competing in a Guerin Catholic uniform, Friday night basketball games in the student section, and rock concerts at the end of an All-School Mass. I miss the retreats, hot chocolate Fridays with Mrs. Horn in Kairos, and the best cookies in the world at lunch. I miss seeing the entire school cheering on the women’s soccer team in the Sectional finals and racing at night under the lights at a home track meet. But more than anything else, I miss the people. Guerin Catholic is a community unlike any other because from the second I walked through the doors as a freshman, to this very day, I have felt an incredible amount of support and love from people who genuinely care about me. Many times throughout my time at Guerin Catholic, my teachers were my biggest coaches and cheerleaders and my coaches were my biggest teachers. My coaches really cared about my grades and my teachers always asked about my athletic performances. The truth is, I didn’t become the first female track athlete to make it to the State Championship through just hard work and some talent. I didn’t break school records, earn 8 varsity letters, or win All-Catholic titles because I was a good athlete. And I didn’t become Salutatorian just because I was smart. It was because I had a community around me who challenged me, supported me, and loved me through every mile, game, season, and trimester. It was because the people around me never stopped pushing me to be a better athlete, student, and Christian on and off the field. One of the greatest things the people at Guerin Catholic taught me was how to integrate my faith into my schoolwork and athletics. And they taught me by example. They showed me how to put God first in everything I did because they did just that. Each class and game began and ended in prayer. I saw the incredible value of praying with your team, praising God in your victories and in your failures, and giving all the glory to Him. While at college, I have worked to surround myself with people who care about doing these things just like the people at Guerin Catholic did. I continued to integrate my faith into my athletics and schoolwork even though I attend a public university. My teammates and I pray on the starting line. I attend Mass the day before a race, and I still praise God in my victories and failures. All because Guerin Catholic didn’t just teach me how, but showed me how. When I think back to why I chose Guerin Catholic, I remember visiting Guerin for the first time and feeling at home. I felt welcome and loved even before I became a student. When I was deciding where to go to college, unsurprisingly I looked for the same thing: a place that felt like home. Many people define home as a single place. But really it is wherever you are surrounded by those who love you. I will forever be grateful for my seemingly short and precious time at Guerin Catholic. It will always be a home to me and to whoever allows themselves to be unconditionally loved and transformed by the community. Once a Golden Eagle, always a Golden Eagle. And to the people of Guerin Catholic, I will forever be grateful.